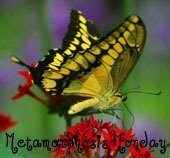 Welcome to the 264th Metamorphosis Monday! I have a mini-met for this Metamorphosis Monday, something that’s so simple but has me pretty charged. (Har, har…couldn’t resist.) I get just as excited about the little improvements I make around here as I do the bigger ones. Do you do that, too? This was my battery storage system–a gallon size baggy. Pretty sad, huh? Whenever I needed a battery, I’d fish the bag out of the basket where I store them here in the office. You may remember this photo below from a previous post when I shared how I’m using all the baskets in the closet Expedit: IKEA Expedit: Sneaking a Peek Inside I’d dig through the bag hoping to find the size battery I needed. What a mess! Recently, I decided to see if I could find a better way to store them. I searched on Google for “Battery Storage” and a number of solutions popped up on Amazon. In my googling and searching, I found out something I had never known. Did you know, if batteries are stored where the ends accidentally touch, the battery can actually get activated and it will start draining the battery? I did not know this! That did it, definitely time to find a better storage solution. Update: Several folks have mentioned in the comments that batteries touching can even start a fire, catching houses on fire! How have I not known this all these years? Scary to think how I’ve been storing them all this time! There’s a link to a video in the comments of this post about a situation where that actually happened. Fortunately, everyone got out okay. I think I’ll put a piece of tape over the top of my 9Volt batteries anyway, just to be safe. I found a storage box online that I really liked but it had some dubious reviews. Mostly the reviews were positive but some folks were complaining it was difficult to get batteries into and out of the AA slots, saying the slots were too small. Other folks were complaining about the battery tester that came with it. Since it was close to $20 + shipping, I hated to pay that and then have issues getting the batteries in and out. It may have been redesigned by now since most of the reviews are positive but I didn’t want to take the chance and have to ship it back. The next day I came across this one below. I’m not wild about the color, would have preferred it in white or cream, but I’m very happy with how well it works. The slots are plenty big enough so the batteries fit and come out easily. It even has slots for small, button batteries. Plus, at $9.97, it was almost half the price of the other one. Do you have a good system for storing batteries? At one time I stored mine in the refrigerator. I had heard it makes them last longer. In my research this weekend, I read it doesn’t make them last that much longer. I’d rather have the extra space in the fridge anyway. I have one of those that I hang in the closet in our laundry room. It works out great, because mine were all over the place. Thanks for hosting this week. I can’t believe I’m early this week. I’ll be back the afternoon to pin lots of goodness. Have a great day. I have never heard of this product. It sounds like something that we could really use. It’s hard to buy a gift for my husband and he may actually like this! I never knew these existed either. Surprised the big hardware stores don’t carry them. Bet they would sell like crazy! Thank you for the reference for the battery charger/ storage unit. I looked for these two years ago for “Mr. Ed” and our son. People that I ask (Lowe’s & Ace) thought I had totally lost my mind! Never heard of such a “thing”! 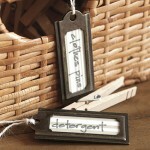 I’m going to order these early and stow away for gifting! Thank you for hosting Metamorphosis Monday each week, dear friend! P.S. YES!!! I did see on the news about your earthquake!!! Isn’t that funny, Pat. You would think all the big box hardware stores would stock them right beside their batteries. Bet they would sell like crazy, especially if folks new the problems of not storing them where they don’t touch. Hope we don’t have anymore earthquakes…such a weird experience! Thank you for the link! I was also just reading an article about how a couple lost a good portion of their home to fire and the culprit was batteries touching so I need to get on this. Mine are thrown in a drawer together. I had no idea that could happen! I wonder why batteries don’t come with a big warning sign on them about keeping them in their plastic packaging where they stay separated. Maybe it’s in the mice type on the back of the packaging and I just never noticed it. Very scary to think they could actually start a fire! Thanks, Laura! Today I’m sharing a book-inspired buffet theme I created for my niece’s baby shower this past weekend. It worked really well, and fed a crowd at the same time. The books were in lieu of greeting cards that normally accompany gifts, a trend I like, and they inspired my food choices. Have a great week. Let’s see what tricks Mother Nature can pull this week! 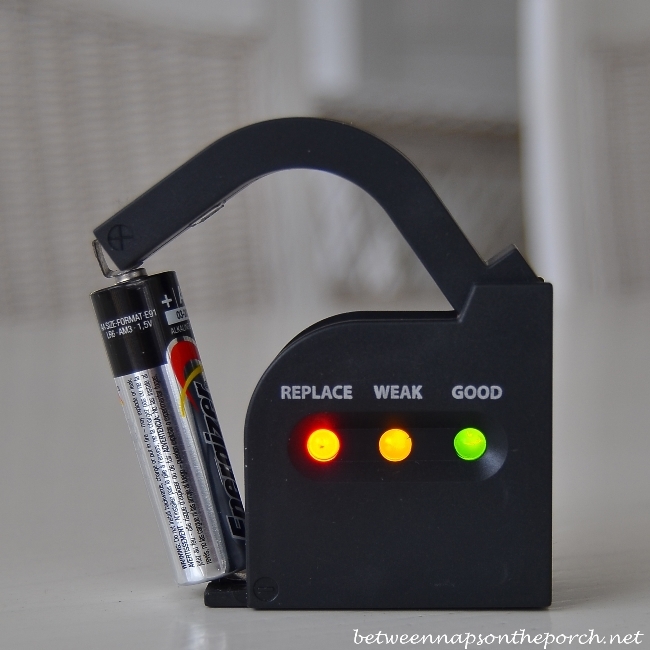 My hubby has a plastic battery container that he stores the batteries in…however, will have to show him this organizer..I love the battery tester….thanks for hosting Susan…hope you had a great weekend! Shirley, have him watch the video someone linked in one of the comments on this post. So scary…apparently they can even cause fires if they touch. The battery tester was a bonus for me but I love it! Thanks, Shirley…hope your week is awesome! Wow Susan, I really am glad you wrote about battery storage today. 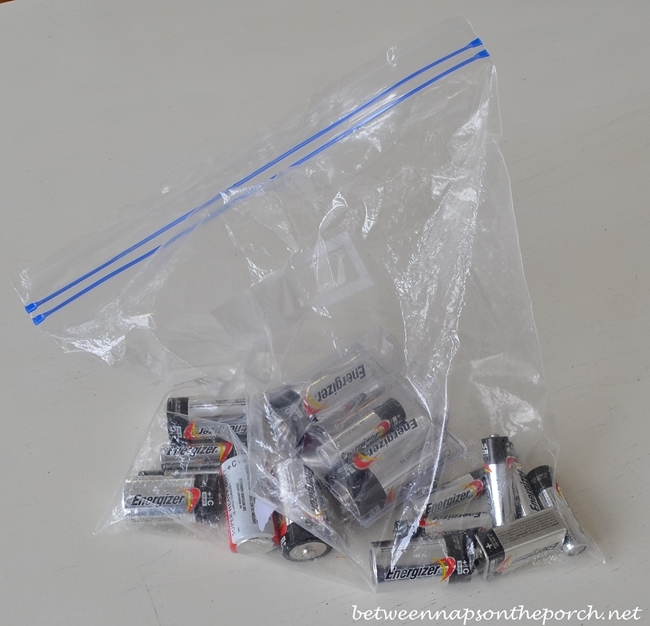 I have been storing my batteries the same way you did, in a big plastic bag. The only difference was that I stored them in the refrigerator. I never knew how charged they were. 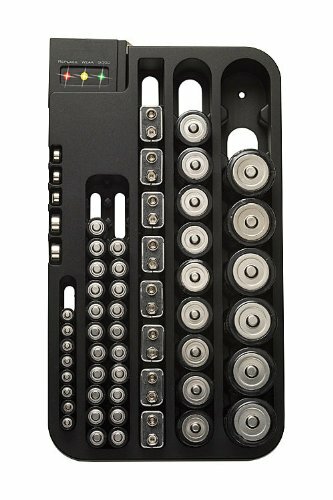 I am going to order this battery holder and finally get battery organized! Our battery storage system is similar to yours. All of our batteries are in a basket so thanks for that tip about the ends touching and draining the batteries. We had reloaded the flashlights during the recent storm so now would be a good time to update our system. I think when I head to the hardware store tomorrow, I think I’ll but another flashlight…thanks for the reminder, Jane! That looks like a great battery storage system, Susan! 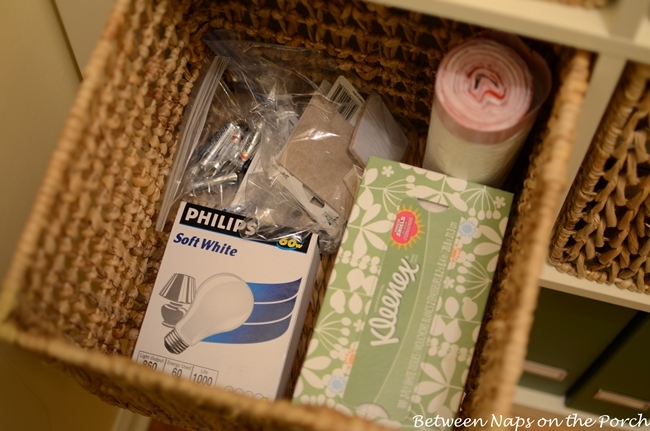 I have little individual drawer units in my laundry room where I have batteries stored according to size. I never heard about the ends touching and causing the batteries to drain. I have heard about the 9-volt batteries (any with the raised connections) causing fires, so you need to put a piece of electrical tape over the end. Thanks so much for hosting another great party, Susan! So scary! I did that this afternoon after watching the video Marcie shared here in the comments. Wonder why they don’t warn folks about this! Have a great week, Carol! Thanks for all the battery tips Susan! My hubs is Mr. Battery tester, always testing testing and I’m saying, just change it!! Have a great warmer week, and thanks for the party! Thanks so much for hosting Susan…have a great week!! Hello Susan! I’ve never thought that the batteries touching one another like that can drain them – that makes sense – this looks like a great product! So delighted to join your party – I hope you enjoy this beautiful week! Thanks, Kathy! Hope your weeks is awesome! That’s weird that’s it doing that, Laurie. Thanks for letting me know. I’ll go check and see if it shows there are links in need of moderation. I have no idea why it’s doing that. I’ll have to check with Mr. InLinkz and see what causes that. Thanks again for letting me know! Laurie, I just had a thought. Did you put in your “Permalink” when you linked up and not just your general blog address? I just looked at the party linkup I set up in InLinkz and I had left the box checked that said to only allow permalinks. I prefer that because that way if someone comes across the party months from now and clicks on your link, it will take them directly to the correct post and not just to your home page. Just wondering if that may be the reason it held your link for moderation. I sometimes check that box but not always. Just wondering if that’s why it held it for moderation. 🙂 Update: Never mind Laurie. I just looked and you did use the permalink…so I have no idea why it did that. I emailed Mr. InLinkz…we’ll see if he has any idea. I don’t like that it’s doing that. I read an article within the past couple of weeks about loose 9 V batteries causing fires. Some guy had changed his smoke detector batteries and he placed the used ones in a paper back to take for recycling. The terminals on the loose batteries touched and ignited the paper bag . It caused his house to catch fire. This is a timely post with spring right around the corner and people will be changing their smoke detector batteries during the time change. The officials suggest putting electrical tape over the terminals before discarding or storing loosely. I got lucky several years ago when I was buying assorted battery sizes for our new RV. They sold an assortment with a battery tester in a plastic box with slots to everything in place. I loved it so much that I bought one for the house too. My only complaint is the box only holds two 9V batteries and I always need more during time changes. I like your storage box as you can easily see the size battery that you need. Soooo scary! I just feel lucky something like that never happened in my home. I definitely haven’t been storing them correctly. Thanks for the tip, Kathy. I put tape over the one battery I had today and will do that to any others I buy. I wonder if it’s just the 9 volts that can start a fire. I’ve only read about the 9 volts causing problems. My husband says the 9 volt has more power than AA or AAA. Even a DEAD 9 volt has enough charge to cause a fire. Needless to say, I’ve started treating all my batteries with a little more respect. I have the same battery organizer and mostly use it with rechargeable batteries. Thanks for hosting! Good to hear it works with those, too! Thanks, Jooselyn! 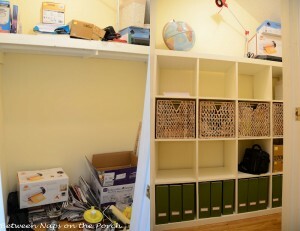 I like the storage container. I didn’t know a battery could start discharging it the ends were touching each other. My hubby says he was carrying two 9 volts in his pocket when he was a teen and they got hot. That’s when he learned about the danger with those. I heard there was another earthquake in S.C. on Sunday- did you feel it? No, didn’t feel that one. Wonder if it was an after shock? Thanks for letting me know, Liz. That’s amazing about the batteries! Yikes! Hi Susan, sharing some gardening projects with you today, thanks for hosting! Have a great week, Cindy! Marcie, I feel terrible for that poor guy. He was just trying to do the right thing and recycle and look what happened. Thanks for sharing the link. Never knew batteries could be so dangerous. I didn’t know they could start fires either, that video sent me running for our junk drawer to gather all the batteries together and secure them. I do like the organizer you have, thank you for sharing it. I do enjoy your blog Susan, I am glad the weather is warming here in the south. Thanks, Suzanne! Have a wonderful week! 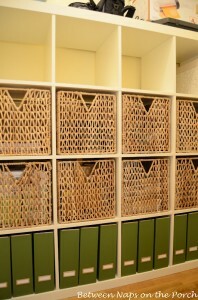 I love organization, so I’m loving this battery storage idea. I have also adopted the plastic bag o’ batteries idea so using this would be great. Thanks for the tip and thanks for hosting MM. Have a wonderful week. Great post!!! I’ve been using the gallon ziplock for several years myself! Now I know why some of the ‘new’ batteries are not working! I like how flat the battery storage/charger is too vs the bag spreading out everywhere. Definitely on my shopping list this week. Vanessa, just make sure your 9 volt batteries don’t touch…they can start a fire. I just learned that today! Scary! Susan, thanks for the reminder regarding the 9 volt batteries, did an inventory and do not have any of those right now. Enjoy your day. So happy we are finally having SUNSHINE!!!!!!!!!!!!!!!!!! 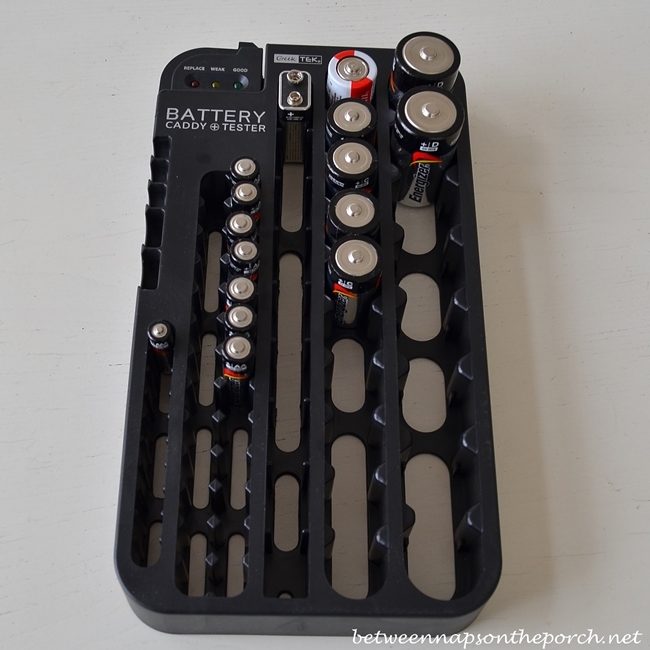 Love this battery organizer. I have mine in a plastic shoe box right now. Seems like everything I owe takes batteries, and finding a place to store them is a pain. I’m going to check this one out. Thanks for sharing. Me, too! I went through the house checking to make sure all the flashlight work. Hope you kept your power during the storm! I LOVE that battery organizer…what a great way to store them and see what you are getting low on. Thanks so much for hosting! Thanks, KC…have a fabulous week! Susan, THANK YOU for this post! My batteries are actually really well organized in a little plastic file drawer I have. Each size is stored separately in plastic trays within the drawer and I have a battery tester in there, but I NEVER heard about the draining issue, much less the FIRE issue! Yikes. I ran right to that closet and checked and luckily, the way they are arranged, none of them are touching ends, but wow, that scared me. I have never heard of it either and I am the Queen of fire safety, lol. How strange. It sounds like the 9 V are the worst culprits but it’s possible with any. Like you, I wonder why this isn’t better advertized? Grrr. Thanks so much for this enlightening information. 🙂 Have a great day. Scared me, too! Who knew? They really need to put it on the front of the package in BOLD letters! Thanks, Pam! Thank you, I love these type of posts. My batteries are in a plastic bag. I am going to tape them until I can get new storage. Thanks for another fun party, too, my friend! Always so much inspiration here!!! Thanks, Laurie! Hope you like it…I’m really enjoying it! Thanks, good Lord I cope up the hard day at work. TY Susan for the everlasting tips. So much appreciated from my & MOTH’s part, knowing your smart ideas. He send a thumbs UP for you. Job well done. Hope you visit and see my creation LoL* (just a good rating) but I am working to be great, in my way. Well Susan you just rocked my world! I’ve been looking for a battery tester for a couple of years now, ever since the one I bought through Avon several years ago stopped working. I discovered these are hard to come by and have been unsuccessful in my shopping attempts. After visiting the party I am heading straight over to Amazon to order one of these! Especially considering the fire hazard – I’ve been storing ours in a clear plastic shoebox, yikes! Thanks for hosting the party again this week and for the awesome information!!! Marie, it scares me to think how many years I’ve been storing them in baggies or just tossed in a kitchen drawer. They should have giant warning right on the front about the dangers of possible fires. Glad this was helpful. The tester has worked great for me, so far. Hope it works well for you too. FYI Susan, unfortunately I discovered these cannot be shipped to Canada. I found a similar one at Amazon.ca that I ordered. Thanks for the party and the tips on battery storage!! Susan, I think the company that ships out this battery organizer is going to wonder what happened! I just ordered mine and can’t wait to get it since I have been in organizing mode here lately. Like many of the comments, I have been storing our’s in zip-lock bags inside a cardboard box. This will save time in finding the right battery & I’m sure the charger will come in handy too. Thanks for sharing such a great idea! Thanks, too, for such an entertaining & informational Blog. I really enjoy it and feel like I know you in person :). LOL, You could be right! They may be wondering why there’s a sudden interest in their battery storage boxes. Thanks Linda, so glad you found this helpful. I just seemed to important to not share. I figured if I was storing my batteries all tossed together, others might be, too. My entry hall furniture has a bunch of small drawers. 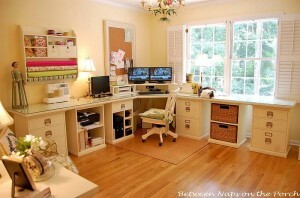 Pretty, but it was not useful for storing stuff until I looked at my various junk drawers around the house. So each of the drawers has a purpose. I have one drawer for batteries and I used some old mugs to store the batteries – one for each size. So it is easy to see if I need more and they are all in one central place. By the way, I also have a radio and a few lanterns that use solar/crank power to charge up the system. It is worth it to have these items in case of storms when you can’t go out to get fresh batteries or they are all sold out! Hello, Susan…love your blog. I too recently heard that battery poles touching would drain them, but didn’t know it could start a fire! I also kept mine in a baggie until recently. I learned that you can re-charge regular batteries. They will re-charge several (up to 10) times…so I bought a $27 charger/tester…then I organized my batteries in cereal box bottoms I cut to the right size..not pretty, but free and works well. Re-charging them is working great! Misti, I didn’t know you could recharge regular batteries! Thanks for letting me know about that! I never knew you could re-charge regular batteries as well. I try to use mostly rechargeable batteries, but do have a stash of regular batteries and this storage system is fantastic! thanks for sharing.